Pursuant to the settlement reached with Karl Lockhart ’18 in Anonymous 3L v. Court of Petty Appeals, and Justices thereof, in their official capacity, but especially Chief Justice Goldman and Justice VanderMeulen, Docket 17-139, October 4, 2017, the Virginia Law Weekly has agreed to publish old decisions periodically. 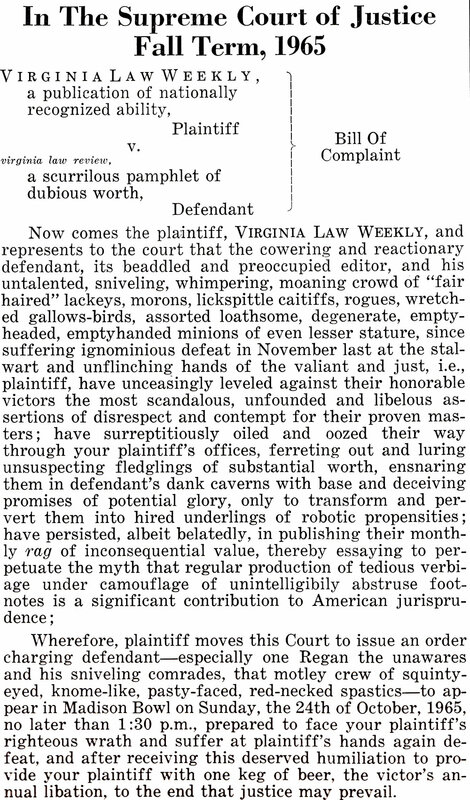 It is with great pleasure that the Court of Petty Appeals publishes the following decision from the October 14, 1965 edition of the Virginia Law Weekly. While the current Court would never refer to members of Law Review as “degenerate,” “gallows-birds,” or, heaven forbid, “lickspittle caitiffs,” the Court is intrigued that, despite all the changes over the decades, some things remain constant.